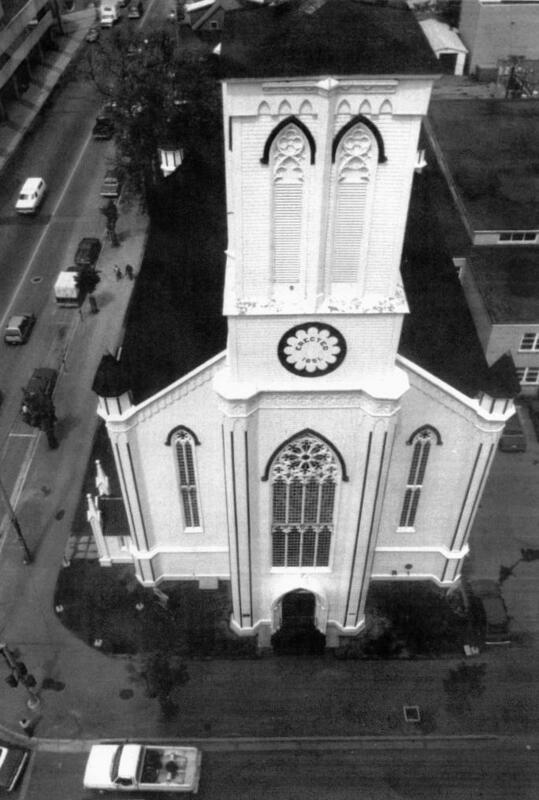 Wilmot is the last of the large frame churches that dominated the city skyline throughout the 19th century. It was designed by Matthew Stead, an English-trained architect, and is an example of the style known as "carpentry gothic". "To us of the West the Gothic appears as the most numinous of all types of art... The semi-darkness that glimmers in vaulted halls, or beneath the branches of a lofty forest glade, strangely quickened and stirred by the mysterious play of half-lights, has always spoken eloquently to the soul, and the builders of temples, mosques, and churches have made full use of it." Worshippers at Wilmot know what Otto means, especially when they have been to a Christmas midnight service and been moved by silence, semi-darkness, and the magnificent vaulted ceiling. 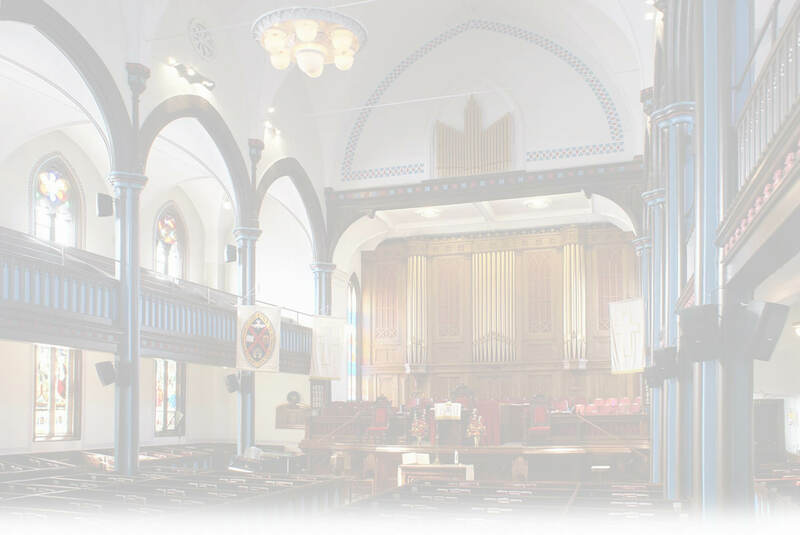 The church now accommodates 800, including the capacity of the balconies and the choir loft. The construction crew erecting the building was comprised of local ships' carpenters whose work on the wooden vaulting echoes that on the bows of wooden ships. 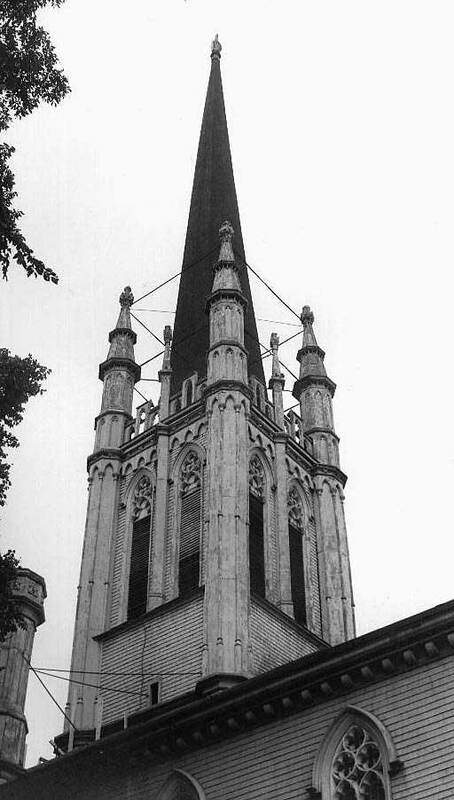 The spire ascended 199 feet and was further extended by a 7 foot upward-pointing hand carved in wood by Edward Charters. It was this symbol that caused the soldiers of a British Regiment stationed in the city to nickname the church "Thumbs Up". 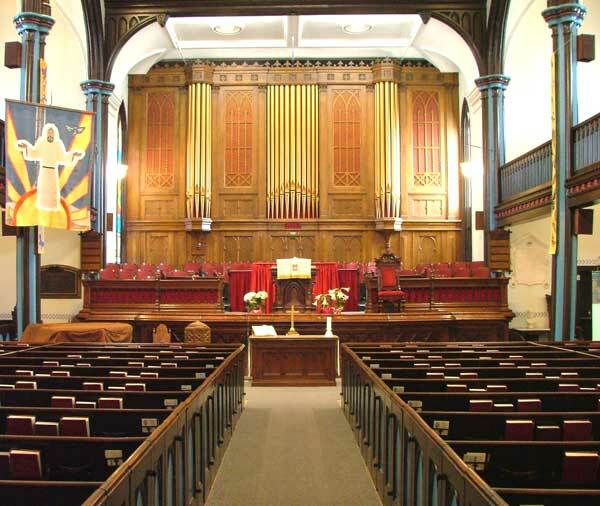 The spire at Wilmot was removed in 1974 because of structural weakening, and the wooden hand is now on display in the Sanctuary. For over 15 years various people searched for the location of one of the William Morris and Edward Burne-Jones stained glass windows said to be in Canada. The entry in the Morris and Co. account book said that the window was going to Ottawa, Fredericton, Canada. In the summer of 1990, two art curators visited Fredericton to look for the window because they were organizing an exhibit of Morris artifacts in Canada. They found it in Wilmot United Church. "I am interested in the Morris and Co. windows. There aren't many in Canada and this one was hitherto unknown. So this is an exciting and important discovery. It's a very wonderful window." A photograph of Wilmot's famous window was featured in the catalogue of the traveling exhibit. The window was installed in 1913 on the north side of the sanctuary, the second window from the front, a gift of Senator Thompson in memory of his wife. Morris and Burne-Jones had died many years before, but the Morris company continued to use the cartoons and designs that both men had created. The two angels, Gabriel on the left and Raphael on the right, were designed by Burne-Jones for a special window he donated to his church in celebration of his daughter's marriage there. The Wilmot angels are from the fourth and last stage of Burne-Jones' style, and the more heroic stance of the figures demonstrates the influence that Michelangelo by then had on his work. These stately, graceful figures also show by their elongation the influence of early Christian mosaics. Raphael has a cockleshell in his hat, a sign of the pilgrim, and he carries a pilgrim staff. The head of the other angel, Gabriel, is wreathed, and he too carries a pilgrim staff. John Henry Dearle designed the lower part of the window, depicting two acts of mercy, feeding the hungry on the right and clothing the naked on the left. Dearle was the first apprentice of William Morris. His importance and talent have only recently been recognized. Evidence of his skill as a designer can be seen on the left side, in the posture of the leg and foot with its splayed toes. The background design of intertwining stalks and acanthus leaves was introduced by William Morris in 1872, and thereafter became almost a signature of the firm. The dominance of green, slate blue, rosy red, and pale yellow, colours characteristic of Morris windows, makes this window stand out from the others of Wilmot in which the primary colours of bright blue and deep red predominate. 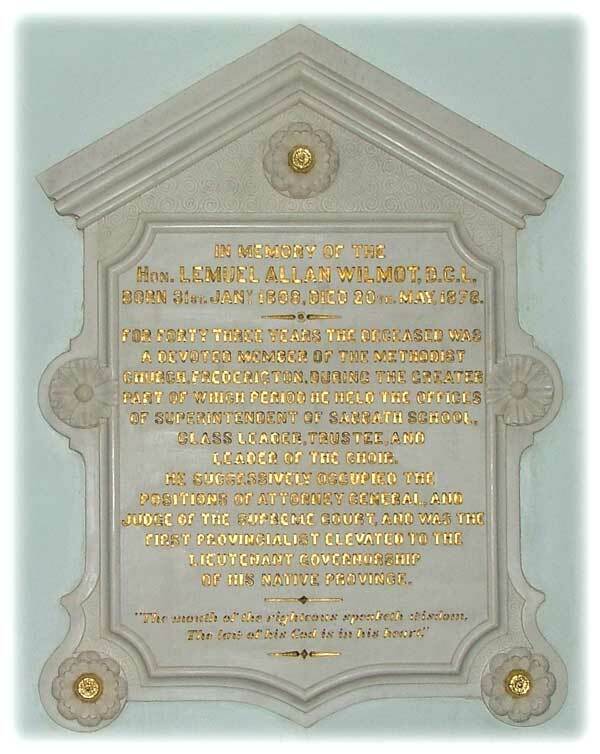 For more information about this window, including a photo of its inscription, see Windows page 2. Other artists have created beauty in this church. In the late 1940s famous Canadian artist Alex Colville designed the stencil decoration in the sanctuary and determined the colour scheme of a dull red, a mid-blue and a somber brown for the painted woodwork to emphasize the gothic architecture. The Hon. W. J. 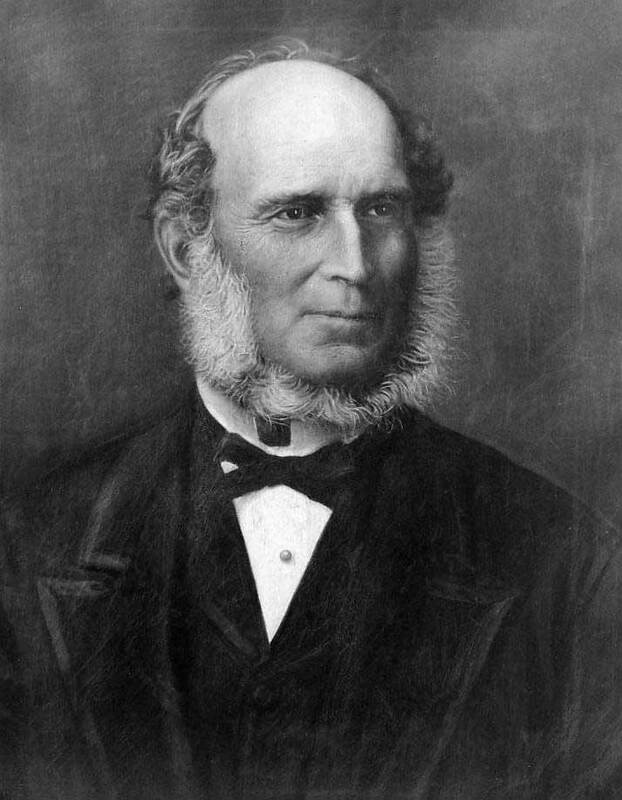 West, former Chief Justice, commissioned Colville. West's daughter, artist Mary West Pratt, said that then, as a young artist, she found the scheme "exhilarating" but, "The old guard was upset." Colville suggested a red rug and blue robes for the choir. Pratt said that Alex was "astounded to be asked and very pleased", because he hadn't expected to be treated as a professional in the Maritimes, and he was surprised to be paid. He trained the late Jean Anderson and some other amateur artists how to mix the paint. "A former professor of mine had done the decorative scheme for Fawcett Hall at Mount Allison, and I thought if he did something like that, possibly I could." In October of 1994, Colville, in Fredericton to deliver a lecture, returned to Wilmot. He was pleased and quite surprised, he said, that his colour design was still in use. "These are the two finest ecclesiastical drawings I have ever seen." 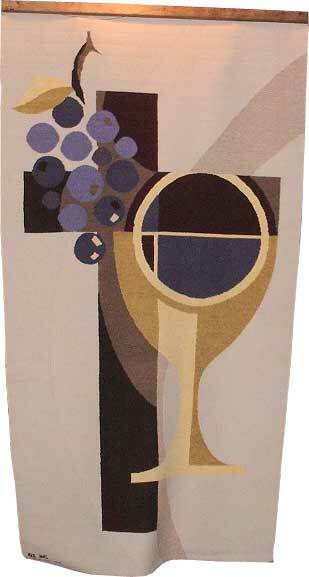 Here is a link to the current list of Wilmot's tapestries, including photos. James Holman painted a portrait of Lemuel Wilmot in 1879, paid for by small donations from the children of the Sunday School. It was "displayed in a store window on Queen Street where it was inspected by the governor general, the Marquis of Lorne and his wife, the Princess Louise." It was restored in 1999 and now hangs in the church parlour. Other art works in the parlour include an early Tom Forrestall seascape and a painting by Lucy Jarvis, "Study in Flowers." A Jarvis drawing, "Master Alan Sweeney", is in the small office. "The whole tablet, with its handsome design and beautiful gilded letters, is a very fine one."